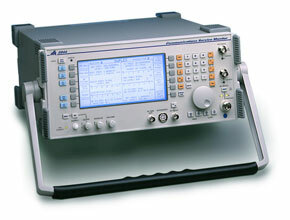 Aeroflex IFR 2944B : Service Monitors Other Types of Equipment - Test Equipment Connection - Prüfgeräte zu verkaufen - verpachten - vermieten. Cost-effective RF testing tool for the RF professional who demands more from a communications service monitor. The 2944 Communications Service Monitor is the lightest, most rugged service monitor available with a full performance spectrum analyzer as standard. Designed for the wireless communications professional, the 2944 includes high powered accuracy and features at a very affordable cost. RF professionals involved in day-to-day AM/FM measurements can use the 2944 to perform all of their transmitter and mobile unit measurements without having to pay for ´extras´ that add cost to other service monitors. For field work the 2944 provides an excellent combination of instruments for all types of maintenance work. In the workshop, it provides all of the performance you would expect for exacting measurements. Remote control is provided with an RS-232 interface as standard. An IEEE-488.2 interface (OPT5) can be fitted where other instruments are required to operate in a system with the 2944.